Back to the Kitchen – Tofu Filet? With all of the ballyhoo in the news surrounding a certain chicken sandwich establishment, Steve decided he would try making his own chicken, Google to the rescue! The secret, as you may know, is marinating the chicken in pickle juice and making sure you spice the flour for beading. As with most recipes in my house, I decided to make a vegan/vegetarian version; Tofu Filet. 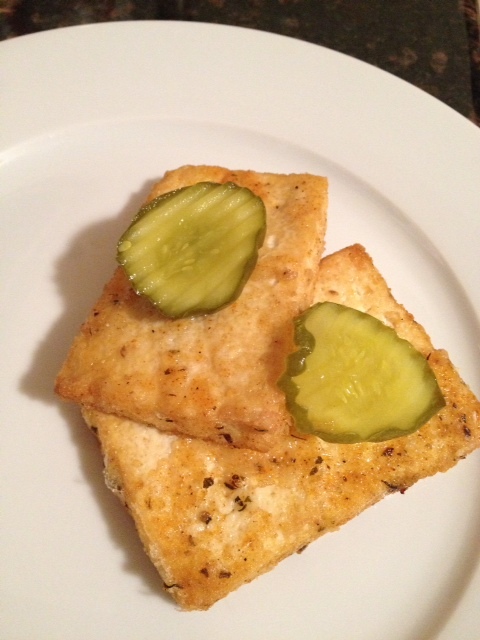 Marinated 1lb sliced and pressed extra firm tofu in pickle juice for about 2 hours. I used cornstarch seasoned with paprika, garlic powder, onion powder, cayenne, salt and peppers the breading and fried it in peanut oil. I did finish it off in the the oven for about 15 minutes to dry it out a little. Served with pickle slices and a little harissa mayo. In my opinion, it turned out pretty well. There will be some experimenting with squash, in soups and roasting. I will also be making vegetarian marshmallows for an upcoming children’s Halloween Party we are having, I will definitely post those. There are a lot of others, I will post as pictures and recipes as I go.